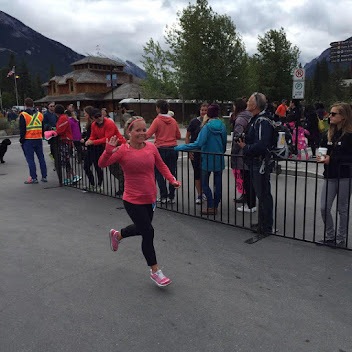 Last weekend, I participated in the Calgary Marathon for the very first time ever, but definitely not the last. One of my good friends + running partner for the Seawheeze in August accidentally purchased both the 10K and Half Marathon packages and didn’t need the half so I bought it from her so she wasn’t out a $100. It worked out for both of us. Of course the bib had her name on it but on race morning, I put a sticker over top and wrote my name which I actually forgot that I did so I was really surprised when I was congratulated at the finish line by my real name haha. After some really ugly cold days, race morning was beautiful. I was at the train station at 530 so I was able to see the sun rise over Calgary and it was beautiful. Although this marathon was by far the most disorganized marathon I have ran in, the route was spectacular. To run down 17th and through bridgeland in the early morning was great. And I loved running through Kensington in our stomping grounds and through memorial. I am so excited to run it again next year – who’s with me?? I really enjoyed all the people entertaining the runners along the route (way better then rock n roll in San Fran) and all the lovely volunteers who made sure we were hydrated and all the great people who came out to cheer us on as we ran. It was really motivating. I was really impressed with my time for this half marathon. I have been struggling with a nagging knee injury that just will not go away and really my goal was to beat my time in San Francisco which I probably should never have ran in the first place. I probably could have done better had I not had to use the washroom and stop for a light on a street so cars could get through and to let an emergency vehicle through to a runner. I normally just run with time and distance on my watch but I had Greg switch it up after Eyeball the Wall because I was running way too fast at the beginning of the race (like more then a minute faster then my average) and by the end, I was done. And so for the first time, I really paced myself at the beginning so that didn’t happen again. And it really worked out which made me happy. I think though that I can start running a bit faster at the beginning to get my time down so that I can get to my full marathon sooner. As long as my knee holds out that is. This also marks the first time that the girls have seen me run which was awesome. The end of the marathon is in the grandstand so that the spectators all have seats to watch and you are not crowded along the road trying to get a view of the finish. Then they just go back into grandstand and they have meeting areas alphabetized so you can find your party quick. It was nice. My face was so red when we finished – I didn’t know if it was a sunburn or just heat. It was a bit of both, but definitely more heat then anything. After the race, we headed over to The Beltliner for brunch. I am a huge fan of Eric Francis and have been wanting to go forever but I am not big on waiting at restaurants so we hadn’t made it out yet. Thankfully because we were willing to sit on the patio, the wait wasn’t long at all. This place is amazing. The food is simple but so delicious. They even have fruit loops on the menu for the littles. The decor inside along the wall to the bathroom is one for every sports fan. And the bathroom I was in had the coolest posters that I really want for my own house. I went with the Baked Chocolate Milk French Toast and it was even better then I could have possibly imagined. I am a huge French Toast fan and this was seriously the best I have ever had. EVER. Even if I had to wait an hour or two, it still would have been worth it. Such a perfect reward after a long, hot race. The best part though was the next morning when I was barely sore. It was the best I have felt both right after a race and the following day. My knee bothered me a bit (and is still a bit bothersome) and I had a knot in the ball of my left foot which is still kinda there. I was so happy with how far I have come this last year of running!